An Italian classic with a gluten free twist. 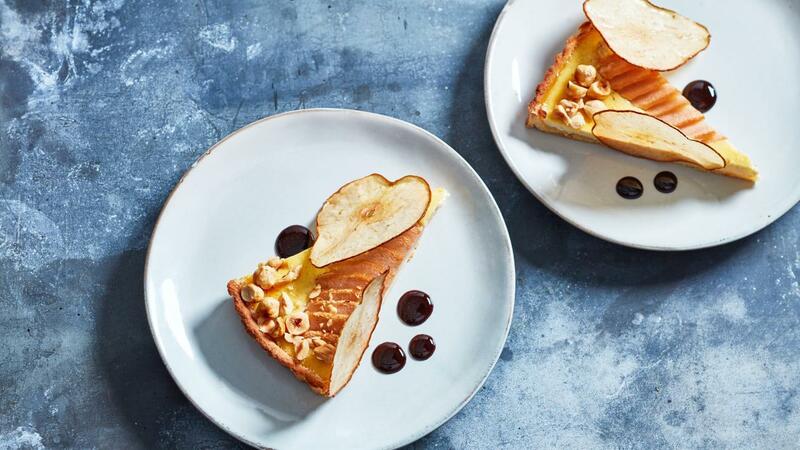 This pear ricotta crostata with rice crust is creamy and rich. Serve it with a delicious chocolate sauce for an exciting flavour pairing. Preheat an oven to 170c. Line a 23cm cake tin with greaseproof paper. Sieve the rice flour, xanthan gum baking powder, sugar and a pinch of salt. Cut the MEADOWLAND Professional 250g into small pieces and rub into the flour mix until it resembles breadcrumbs. Add the egg and mix until a pastry dough is formed. Cover with Clingfilm and allow to chill for 20 minutes. Sprinkle a work surface with rice flour roll out the pastry into a circular shape to fit the bottom of the cake tin. Place into the prepared tin, patch together any holes or cracks (this won’t affect the baking of the base). Dock the base of the pastry with a fork. Chill in the fridge for 20 minutes. Bake for around 15 minutes until lightly golden and crisp. Remove from the oven and set aside. Zest the lemon. Scrape the seeds from the vanilla pod. Whisk together the ricotta with the caster sugar, lemon zest, vanilla seeds, ground nutmeg and eggs until smooth. Juice the zested lemon. Peel and halve and core the pears. Slice widthways and squeeze the lemon juice over the pear slices. Leave to marinade for 5 minutes. Pour the ricotta mixture over the prebaked base. Arrange the pear slices decoratively over. Bake for around 40 minutes or until just set. Allow to cool. Melt the chocolate in a bowl over a pan of barely simmering water until completely smooth. Heat all of the remaining ingredients in a small saucepan until evenly combined. Remove from the heat and stir through the melted chocolate. Cut the crostata into slices and top with the crushed hazelnuts and drizzle withthe chocolate sauce.